December 25, 2009 – The Series’ Most Shocking Moment, The Story of Harry’s Past, and What Was I Dead Wrong About? On December 25, 2009 – when I had been blogging here for nearly 10 days – I wrote my first posts on the Chamber of Secrets forum… and quickly got sucked in. Most Shocking Moment in the Whole Series? Finding out that Harry had to let Voldemort kill him in order to destroy the part of Voldemort’s soul that was in him. This was probably the single most shocking moment for me…. as I think it was for Snape. (Or, I should say, it was the most shocking moment for Snape in the Harry plot. Lily’s death was the most shocking moment for Snape in the Snape plot). Finding out that Snape was the Death Eater responsible for delivering part of the prophesy to Voldemort. That stunned me. 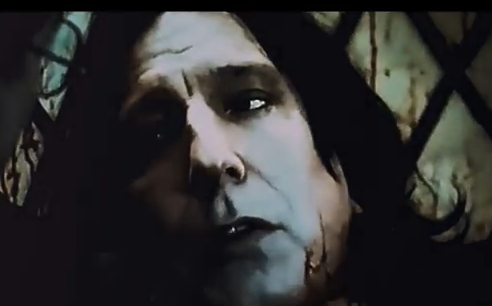 Snape’s death and exsanguination at the fangs of Nagini. If there’s any single scene that shows just the complete self-absorption, coldness and depravity of Voldemort, this is it. He didn’t kill Snape because he found out he was a spy. He killed Snape thinking him a trusted servant who (he believed) just happened to have something that he wanted – the allegiance of the Elder Wand. Does Voldemort have any soul left? Fred Weasley’s death. I don’t know why, but I never suspected Rowling would lay the hand of death on one of the Weasley twins. Harry naming his younger son Albus Severus. I thought it was perfect, and it brought tears to my eyes, but I had to read it a couple of times to believe it was real. I was not, alas, shocked at the death of Albus Dumbledore. I thought Dumbledore had to die in order for the hero to complete his Quest. And I was not especially shocked that Snape killed him… mainly because I knew before I read the books that Snape had done something in the course of the story that led to a huge debate over whether he was good or evil. When I did finally read the books, I personally believed that Snape was Dumbledore’s man and that the killing was most likely planned… but I had no idea as to the details of the plan. Was the Story of Harry’s Past Told to the Children? We don’t actually know if the children know the story of Harry’s role during the Second Wizarding War. What the epilogue indicates is that they apparently don’t know their father is so famous. I like to think that Harry told them the story, but that he told them that battling people trying to murder you is not all that glorious when it’s actually happening – which is the same message he gave the members of Dumbledore’s Army. What Were You Dead Wrong About? I thought Lucius Malfoy would die a horrible, horrible death. I thought the Deathly Hallows would be a place. I believed the mission was to protect Harry, when it was really to get him to sacrifice himself (or rather, the part of Voldemort’s soul in him). I was right about Snape and Dumbledore working together to ensure Dumbledore’s death, but I was wrong about the immediate cause of that collaboration. 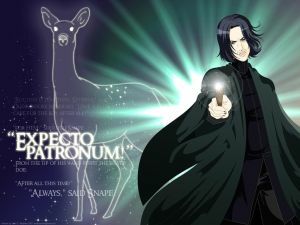 I suspected that Severus loved Lily, but I never imagined that he knew her before Hogwarts, or that he was the first magic person she ever knew, or that Petunia knew him and remembered him talking about dementors. I was wrong that no Weasley twin could die. I assumed Dumbledore was just a kindly, benign, immensely powerful elderly wizard, when he was in fact a master strategist and military genius, willing to ask his men to make extraordinary sacrifices in order to win the war. Waiting for Pottermore: The Movie! Well, a third set of Pottermore emails went out today, and I didn’t receive one. So I took the cue from my Waiting for Pottermore Top 10 List and went to Tyson’s Corner tonight to see the very last IMAX 3D showing of Harry Potter and the Deathly Hallows. To tell the truth, it’s better in 2D. But hey, I didn’t have to wait as long to see the 3D version, and it was a rather intimate showing of the film. Anyway, while I’m off busily writing about DH2, I thought you might find a way to entertain yourselves with this little movie. Enjoy! ETA: OMG! GMTA!!! I just discovered that The Last Muggle posted this same video yesterday! But I solemnly swear I didn’t steal it from her. I found it in a social group on CoS.
Well, I didn’t expect to try to get in to Pottermore as a Beta tester. 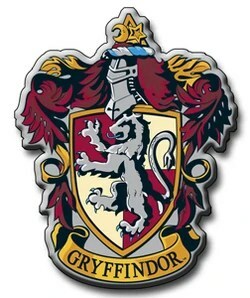 I expected that getting early access would be really difficult, but when I read the Pottermore announcement shortly after midnight July 31 (UK time), I could not help but get caught up in all the excitement. There wasn’t, as rumored, going to be some crazy round-the-Web scavenger hunt, and there were going to be 7 Days to get in to the Beta test group! Naturally, I decided to give it a shot. And I decided to give it a shot on Day 1. I mean, how cool would it be to get in on Harry’s birthday – the day Harry got his own letter to Hogwarts? Since I was already hanging out on a fan site, I got a little bit of insider information. I learned that the first clue would be posted sometime after midnight Pacific time (8am in the UK), and that we would need to go to Diagon Alley. The contest information had already indicated that the first day’s clue would focus on PS/SS. So Diagon Alley was clearly a reference to Chapter 5 in the first book. So of course, I skimmed the chapter and made notes before taking a nap and setting the alarm for 3am (US Eastern). 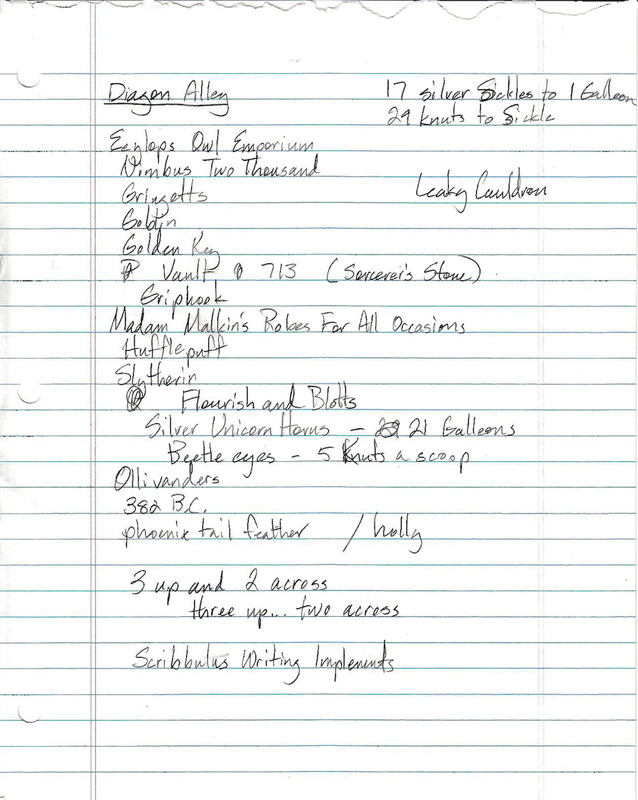 It appeared that we would need to do some sort of calculation, so I particularly noted numbers in the Diagon Alley chapter. 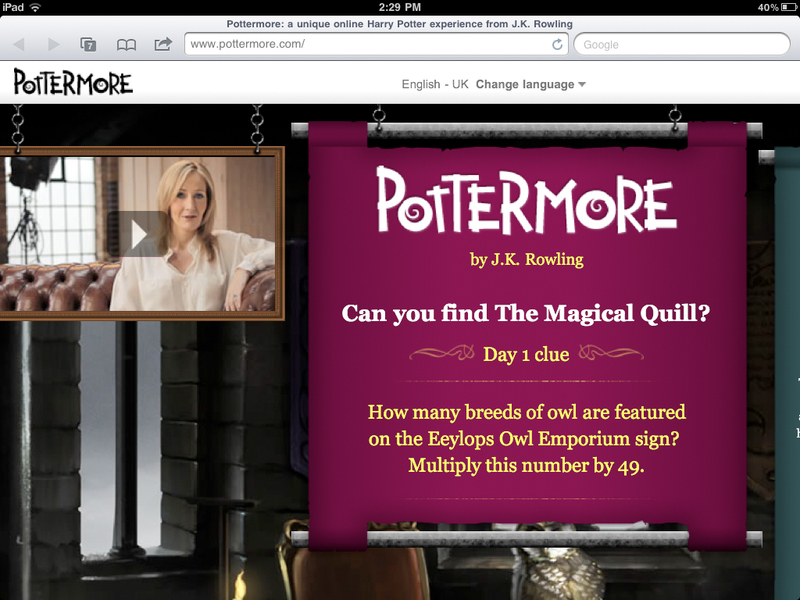 Before taking my nap, I also made sure that I had the address I needed (http://quill.pottermore.com/) already typed in to the address bar on an open tab and that I had a calculator handy for the calculation. I didn’t want to be rushing around in excitement making mistakes if I figured out the clue. That was one number I had not written down! But I did know where to find the Eeylops Owl Emporium because I had made a specific note of it. It was one of the first things Harry saw when he entered Diagon Alley! Five. Five breeds of owl. 5 * 49 = 245. I couldn’t believe it had been so easy! I was pumping adrenalin as I opened up the tab with the address for the quill, typed 245 after the slash, hit Enter, and found myself trying to catch the Magic Quill!!! (Note for anyone who wants to get into Pottermore: you have to do something with the Magic Quill. What you have to do has been different in each of the three challenges so far. But it is not hard to locate the Magic Quill). Everything after that is a bit of a daze. After I clicked on the Magic Quill, I found myself on the registration page, then I saw my name on a list of magical people, and then I found myself having to choose a username. All the while, I was racing against the clock because I needed to get the registration completed before registration closed down for the day! Otherwise, catching the Magic Quill would not have mattered! Seriously?!?!? I could have Asphodel and Phoenix in my username? 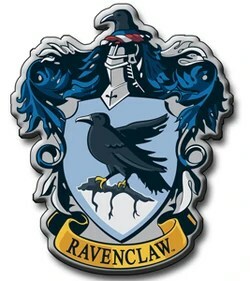 And the Phoenix has been one of my favorite magical beasts since well before a wand with a Phoenix tail feather at the core chose Harry… or before Dumbledore befriended Fawkes or started an Order of the Phoenix! All of my Top 4 characters are implied in that name. AsphodelPhoenix ties together Snape and Dumbledore, Harry and Riddle, and even (because there’s a plant involved) Neville! Just subtract Riddle from the list, and you know who my absolute favorite Harry Potter characters are! Well, the choice was obvious, wasn’t it?!? And when I finished the registration process, I received a lovely piece of parchment confirming my name. I wish I could say that the rest of the process went just as seamlessly, but I was one of the unfortunates who got caught in Yahoo Mail Limbo. It took me nearly 10 hours to get my activation email! But hey, at least I didn’t have to wait as long as poor Evanna Lynch! (Luna in the Harry Potter movies). It seems that she had to wait about 18 hours! 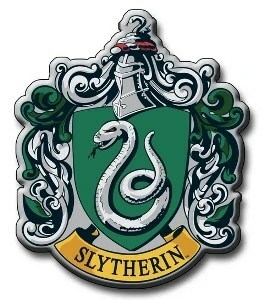 So now, after recounting my own journey into Pottermore, I have something to pass on that I hope is useful to somebody. It’s pretty obvious that the solution to the clue will always be a number, and that the number will be multiplied by something. Day 3: 7 books, 5 days (7 * 5 = 35) – ETA (8/2/01): confirmed. The number was 35. Once Beta testing is over and the entire public is allowed in to Pottermore, I will be re-focusing this blog on the Pottermore experience of re-reading the Harry Potter series. Between now and then, I will re-read (and write about) some random chapters in the series. If anybody has any suggestions for favorite chapters to read, please let me know in the comments!